The Office of International Education for the Peralta Community College District (PCCD) was recognized in the Institute of International Education’s (IIE) “Generation Study Abroad Year One Impact” report for its commitment to increase awareness and advocacy of study abroad. (http://www.iie.org/Programs/Generation-Study-Abroad/About/Impact). Founded in 1919, IIE is a private, not-for-profit leader in the international exchange of people and ideas. In collaboration with governments, foundations and other sponsors, IIE creates programs of study and training for students, educators and professionals from all sectors. These programs include the flagship Fulbright Program and Gilman Scholarships administered for the U.S. Department of State. IIE also conducts policy research, provides resources on international exchange opportunities and offers support to scholars in danger.. This past summer, 2015, PCCD offered four study abroad programs to Europe, Haiti, Ghana and Jamaica. In 2016, PCCD is offering courses in Cuba, Iceland and Ghana. As part of the effort to expand awareness of study abroad, the Office of International Education hosted its second annual study abroad fair at Berkeley City College on September 23, 2015. The fair included a special presentation on Cuban Animation by popular Cuban animators, Mario and Daniel Rivas, that was facilitated by Paul Bardwil of Global Education Foundation, the organization assisting the Spanish Study Abroad in Cuba Program at Berkeley City College, which is scheduled to run in May 28 to June 4, 2016. Facilitated by Drew Gephart of the PCCD Office of International Education, the event was well attended by students from all levels, including international students who are also eligible to join in the study abroad program of their choice. Several vendors, including those from the Peralta Colleges, as well as the Office of International Education, were present to showcase and to answer questions about their study abroad programs. 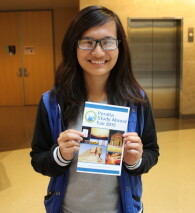 “As a local travel company based here in Berkeley, Go Overseas was proud to participate in the Peralta Study Abroad fair. We’re committed to making international education accessible for all students and this event was an excellent opportunity to promote awareness and drum up enthusiasm for community college students here in the Bay Area,” said Anna Morris, Study & Intern Abroad Director, Go Overseas. The Open Doors Report on International Educational Exchange, released today by the Institute of International Education (IIE), shows that five percent more American students – a total of 304,467 – studied abroad for academic credit from their U.S. colleges and universities in 2013/14, as compared with the prior year. This is the highest rate of growth in study abroad in five years, and reflects building momentum after the two percent growth reported last year. While study abroad by American students has more than tripled in the last two decades, still only about 10 percent of U.S. students study abroad before graduating from college. 600,000 individuals — by 2020, and to diversify that group. Currently, fewer than 10-percent of American college students participate in international study programs, and less than 25 percent of those students are from underrepresented minority groups. At PCCD, there is an emphasis on the importance of global awareness, and a belief that a study abroad experience enhances a student’s global outlook and overall education. “There is a great need to grow the study abroad program at The Peralta Colleges. Due to the necessity for international exposure in the global economy, we are working hard so that Peralta students are better situated to be successful in their careers and in lives,” said Drew Gephart, International Services Manager of the Peralta Community College District.. Launched in March 2014 with 156 partners, Generation Study Abroad has grown to include more than 600 partners that have pledged a total of $185 million in support to make study abroad more accessible to all students. Partners include 350 U.S. colleges and universities, 100 from outside of the United States, study abroad organizations and education associations, as well as 14 country partners around the world – including the U.S. Department of State. In addition, 500 K-12 teachers from 50 states have pledged to take action to encourage their students to develop a global perspective and consider studying abroad when they are in college.